Ita of Killeedy, Ireland, also known as Ida, is one of the two most famous women saints in Ireland, along with Brigid of Kildare. Born near present-day County Waterford, allegedly of a royal family, she was baptized as Deidre. She is said to have rejected a prestigious marriage for a life as a consecrated woman religious. She moved early in her life to Killeedy (in County Limerick), where she founded a small community of nuns and resided for the remainder of her life, in community with other consecrated women. She dedicated herself to prayer, fasting, a simplicity of life and cultivating a gift for spiritual discernment. Ita was well known for having the gift of being able to guide people in holiness. She was much sought after as a spiritual director and confessor. During this period of Christianity, the Celtic Church was more advanced than other churches at the time in recognizing qualities of spiritual leadership in women and in encouraging women in this role. 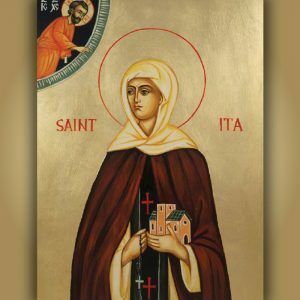 It is thought that Ita may have been abbess of a double monastery of men and women and that she was a confessor to both, giving difficult penances while maintaining a forgiving and compassionate spirit. Confessing one’s sins to a priest had not yet been established as the normal form for the Sacrament of Reconciliation, and ordained priests were not yet regarded as the only members of the Church authorized to hear confessions, forgive sins, and impose penances. She began a school for boys, some of whose graduates became saints in their own right, the most famous of whom was Saint Brendan. She was also known as the “foster mother of the saints of Erin.” The name “Ita” (“thirst for holiness”) was conferred on her because of her saintly qualities. She believed that the three things God most detested were a scowling face, obstinacy in wrong-doing, and too great a confidence in the power of money. Three things she believed God especially loved included a pure heart, living a simple life and great generosity inspired by gratitude for God’s gifts. Ita died sometime around 570 and was buried in the monastery she founded. It was destroyed by Viking invaders in the ninth century. A Romanesque church was later built over its ruins, but that too failed to survive. The site, however, remains a place of pilgrimage today. Ita’s feast day is January 15. Although not on the Roman calendar of saints, her feast is celebrated as an optional memorial in Ireland.